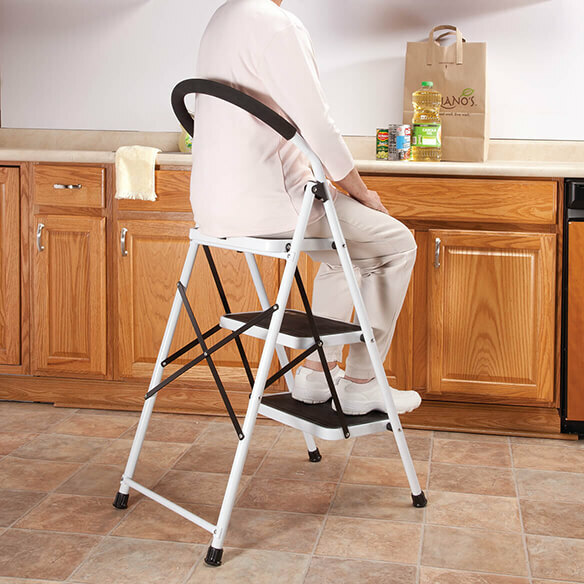 Steel step ladder stool combo features extra-wide steps with anti-slip treads. Padded safety handle doubles as a comfortable backrest when you need a seat in a pinch. 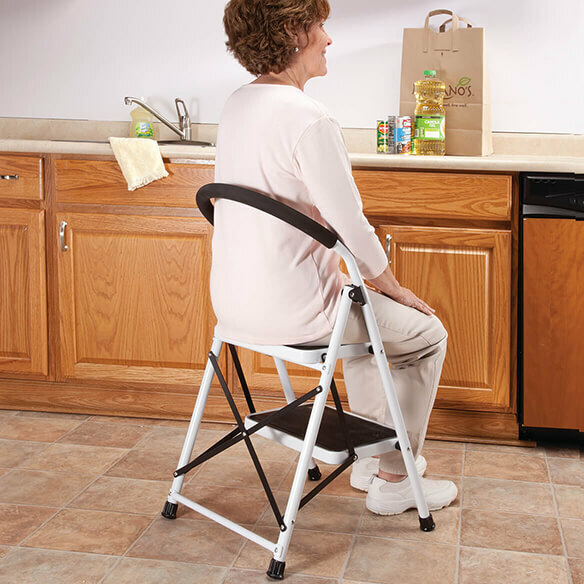 Space-saving design of step stool chair safely locks into place, folds to just 3" D for storage. Supports 300 lbs. Steps measure 14 3/4" W x 10 1/4" D x 1" H. Two-tier ladder measures 19" H. Three-tier ladder measures 29" H. No express shipping. I love it. I'd buy it again!!!! Just what I needed!!!! I'm short and it gives me the height I need to organize and retrieve things on the high shelves in my cabinets thank you!!!! This stool is amazing !! I wish I would have found it years ago !!! I have been looking for a 3-step ladder that was sturdy enough and easy to maneuver. This is the first one I found that is rated to hold 300 lbs. and is easy to open and close and is not too heavy for me to move around. I am very satisfied with this purchase. When U open it, it locks into place, very safe. Wide steps, with slip resistant tread. Sorry I didn't buy 2 of them. I use it inside/outside the house, very versatile. Versatile ladder. Already used to reach back of pantry shelves and hand curtain rods. I used this product because I am only 5 feet tall and have a hard time reaching the smoke detectors to change the batteries and a hard time reaching clocks and changing light bulbs. I finally broke down and bough this and I used it a few times and I love it. Don't know why I waited so long. I bought the three step one as I have a similar one to the two step that is ok for some tasks but not all. I purchased the 2 step model. It is perfect for my needs. I've had a hip replacement and feel totally safe using this easy to use step stool. This is a very useful article for me. I am comfortable and feel secure on the steps. I am 74 years old and do not climb on just anything. I used it as soon as I got it. It was perfect. it is great to use around the house. especially for changing light bulbs, using top shelves in cupboards, top shelves in closets, washing windows, etc. I just love it. So easy to open & close & store. Finally, I have found the perfect step stool! We have been dangerously using a card table chair for years and I thought that was crazy! This stool is very heavy duty...we feel really confident using it. Others we have had were cheaply made and eventually warped. Very sturdy and the handle is a great option! We are mid 60's and very careful about ladders and step stools. We will worry no more. This step ladder is very sturdy without being too heavy. I love the grip handle for added safety and stability. It helps me get things done without having to rely on help from others. Perfect for what I needed it for. Nice wide steps, easy on the feet. I love this step ladder. My husband uses it to reach our ceiling to take wood stove pipe down to clean out creosote. He use to climb up on wood stove. Getting to old for that. Then tried bringing in a ladder one inch shorter than ceiling. Calamity ensued. I tool to Google and decided this step ladder sounded good. It surpassed my hopes. Plus it tucks being cabinet. So can store it right by stove. Hubby and I very happy. Very sturdy. Good quality item. I love it. This product is easy to use and very sturdy. The instructions are simple and easy to understand; Which makes storage easy. I ordered the two step ladder and put in my kitchen for some better access to cupboards, and it makes a comfy seat as well. This is a great ladder. With its wide steps and support bar, it is very safe. HOWEVER, there is no way I can move it! It weighs 60 pounds! It is so heavy that the box it came in had split open and the carrier had taped the cardboard back around it - on all sides. That did make it possible for me to get it out of the box; I just cut the tape. BUT, it sits by my door because I can't possibly move it! Recommended for a very strong, muscular person ONLY. This product meets all my expectations! I bought the two tier step stool because the sale price was right and because it said holds up to 300 lbs. All the store ones hold up to 230 lbs. The stool is very sturdy and well made. It is also light weight which I really appreciate. Love my new step ladder. Cleaning windows, washing car, changing light bulbs ceiling and numerous house and garage chores.well built and easy to move around. Cant find anything con about ladder. Best item that I have purchase....I love each & every item that I buy off this company,...I always recommend this magazine to all my friends & family...had a few family members that also purchase things too. Needed something I could use when no one was around to reach top cupboards. Also have back and hip issues and sometimes hard to stand to long when baking and other things and the seat is just the right height! Bought 2 of these and they are perfect! Sturdy and great for reaching those items on the top kitchen shelf. Very sturdy, has weight bearing capacity of 300 lbs. Weighs a little over 11 lbs which is not bad considering how well made it is. A little too big for frequent kitchen use so I plan to buy the 2-step version. I'm short so this ladder comes in handy. I am rather short and it allows me to reach high cabinets without fear of falling. Feels sturdy and safe. Highly recommend this product. I really like this stool, it feels so safe to use and I especially like the handle to hold on to. This really makes me feel secure, so much better than my smaller step stool or standing on a chair! I am 5'5", this 3-step ladder help me a lot. I used it to clean out my cabinet in the kitchen. Before I got this product, I would stand in a chair, then stand on the countertop. It is much better with this ladder. I should have been order this product. I purchased this ladder so I could reach high areas: (shelves, cupboards, etc. ), and also so I can clean high spaces: (ceiling fan, cobwebs from upper corners, general cleaning). I am a large person and have mobility issues so finding a ladder that feels safe and sturdy was the most important concern - and this ladder fits the bill! 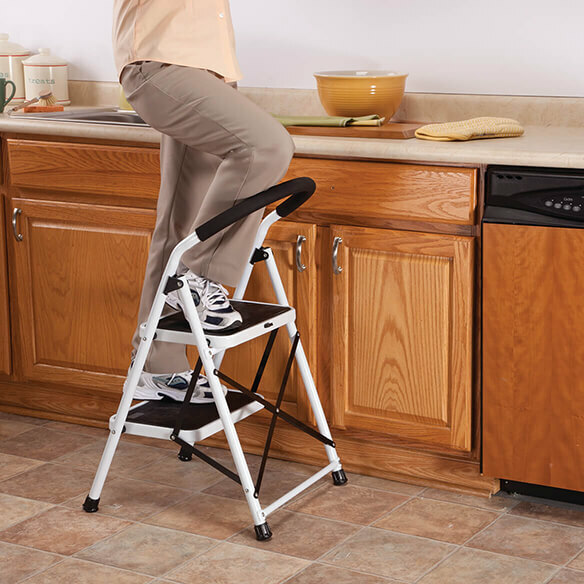 It has generous sized, non-slip steps and is high enough that I can reach my ceiling without having to stand on the top step, which means I can hold onto the back for a stabilizer easily. It folds/unfolds effortlessly and takes up minimal space when storing (can be leaned against a wall or hung on a hook out of the way). I highly recommend this step stool/ladder! It was $50 but it is a better stepstool than most. It's heavy but not too heavy. Seems well made, really nice. Excellent choice for a ladder. Love the grab bar on top . Would not have ordered it if it wasn't built this way!!! It's good that there's a handlebar to hold onto, since I'm afraid of heights. Helps me get to the upper cabinets without strain on my knees and back. I'm 4'11" and always had trouble reaching the highest cabinets in my kitchen. This is a little heavy, but I can manage. What's most important to me is it's sturdy so I don't have to wait for someone to come over and "spot" me, and it can double as an extra seat when I have company drop in. Everyone who has seen it has asked where I bought it. This step-stool replaces a 4 ft. stepladder for work around the home. Large steps and very stable for safety. I wasn't expecting much, given the low cost. I was pleasantly surprised by how well made this step ladder was. It is well made and folds up easily. I am so happy they made a step ladder with wide steps makes me feel so much better when I have to clean high up. the stool is for me in the bathroom, to sit and do my hair, or put on make-up. I can not stand very long. we had another stool like this but it is being used for something else. so we needed another stool, and could not find one locally. there was an ad that came in the mail and there it was, on the back of the book. glad we found it. I like it and am satisified with the product. My dislike is it was advertised a 3" wide. We live in an R.V.and space is a concern, we had a 3 1/2" space between the frig. and a cabinet. but it will no fit until I take it to a shop and have 1/2 of the 30* angle the top hand rail is bent to taken out. Then re-paint etc. Great useful product. Got it for someone too short to reach top of kitchen cabinets. The 3 step is a good height and has handles to hold on to. It's handy and useful for quick reaching highs. Folds into small space and easy to carry. I have the two step, but I am short and found it was not quite tall enough to reach the areas I wanted to. Also, the bar helps me to balance! I have been looking for two tier step ladder for quite a while until I received your catalog with great reviews. for convenience in reaching shelves in kitchen. It's safer than climbing on a chair! I am short and cannot reach the top shelves in the cupboards in my kitchen. Now I will be able to!! Our daughter got paint all over our old one. Appears to be quality built and had good reviews. it is just what I need to reach items that are higher up, now that I have lost height. sturdy. holds up to 300 lbs. I need it for home repairs in my apartment. I'm disabled and cannot stand in one place for very long. Also need to be able to get a little higher sometimes. Because I'm short and am tired of waiting for my son to come over and change light bulbs. I chose the one with 3 steps..Why does the picture show 2. The boss really needed this, for sturdiness, reach and safety. She can now look in into upper kitchen cabinets much more secure. I can 't use a step stool, but this ladder has handles and should help me to reach on top of my cabinets. It's the only step stool I found that holds 300 lbs. It seemed the most appropriate for my needs. Chose 3 step stool to reach items and sitting. I need help in the kitchen reaching things stored in the tops of cupboards. I need a step stool for my kitchen that has taller cabinets. I have looked so many places for a ladder with wide steps. Couldn't find one till I received your catalog. A very reasonable price and this will help me be more independent and not have to wait till I can get help. Needed to safely change out batteries for smoke alarm in the ceiling. does it come assembled I need to know if I have to put it together when it arrives or does it come assembled? That is my only question ? BEST ANSWER: Thank you for your question. Yes, this item comes fully assembled. We hope this information will be of help to you. weight of 3 step ladder? BEST ANSWER: Thank you for your question. The three step weighs 15.8 lbs. We hope this information will be of help to you. what is the length and width of each step of the three step ladder? BEST ANSWER: Thank you for your question. Steps measure 14 3/4" W x 10 1/4" D x 1" H. We hope this information will be of help to you. Can you tell me the dimensions, both folded and opened? BEST ANSWER: Thank you for your question. Below are additional measurements we have. We hope this information will be of help to you. •9 ½” from the floor to the top of the first step. • Including the handle, the 2 tier is 32 ½” high and the 3 tier is 46 ¼” high. •The overall width is 18”. •The inside width is 16”. Can I work at my countertop when seated on the 2 step model? BEST ANSWER: Thank you for your question. The height of the second step is 19" from the ground. We hope this information will be of help to you. I guess it depends on how high your counters are and whether you would consider the step stool a comfortable seat. Yes, but not comfortably. You need to lean forward to work. BEST ANSWER: It can be used outside, but I wouldn't leave it out. This is a very useful, heavy duty, steady step stool. We use it instead of a step ladder. I have not used it outside, but it is a very stable step stool and I don't see why it would be any problem to do so. I hope this is helpful. 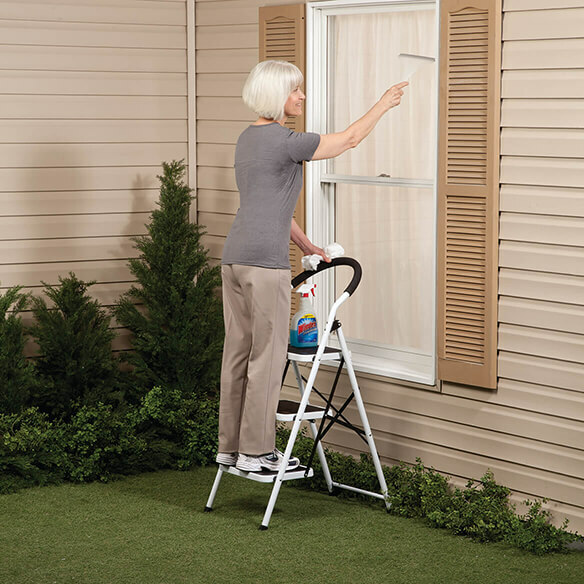 The Step Ladder Stool Combo can be used outside. do both ladders fold into a stool? BEST ANSWER: Thank you for your question. The ladders do not fold into a stool, when the ladder is open, it doubles as a stool. Please see the pictures below the main picture for a demonstration. We hope this information will be of help to you. I have the two step ladder and it does fold into a stool. I slide it between my cabinet and the fridge. How far apart are each of the steps? BEST ANSWER: Thank you for your question. For the Step Ladder Stool Combo from the floor to the top of the first step it is 9 1/2", the second step is 19" from the ground, and the third step is 29" from the ground. We hope this information will be of help to you. Is this a painted white finish or polished chrome? My eyesight is not so good! BEST ANSWER: painted white finish.